With the number of visitors to Nepal reaching a record-breaking 1 million in 2018, experts KE Adventure Travel are seeing a huge trend in travellers looking to find alternative ways to experience the Himalayas in 2019. Beyond the popular routes to Everest and Annapurna Basecamps, trekkers are seeking adventures where they’re unlikely to find many other tourists – or WiFi – on route. Already in 2019 KE’s unique new Lamjung Himal Trek is fast approaching the popularity of the Annapurna Sanctuary Lodge Trek. 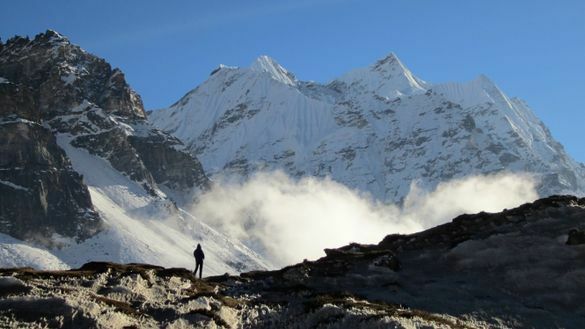 An incredible ridge-top trekking holiday, travellers can expect pristine camping places and sweeping mountain panoramas in a rarely seen corner of the Annapurna Himal. Even further afield, tougher treks such as to Kangchenjunga Basecamps are coming in strong, with travellers willing to take on the challenges of trekking in a remote region for the reward of being in places untouched by tourism. As of the end of January, KE has seen that adventures which require full service camping are already 10% up on bookings for 2019. These adventures, such as the Ganesh Himal Trek, take travellers into regions where the infrastructure for tourism hasn’t fully developed and lodges aren’t readily available, so camping with all meals included is the only way forward. Looking to support areas affected by the 2015 earthquake, travellers are returning to Langtang, a village destroyed in a landslide and rebuilt last year. A remote region and less busy than Everest and Annapurna, in 2019 KE have seen places on its brand new and unique Gosainkund and Langtang Trek increasingly sought after – it’s currently the third most popular trek after best-selling Everest Basecamp itineraries. Known for pioneering itineraries, in 2018 KE’s Tosha Lake Reconnaissance trek was extremely popular – travellers are looking to be part of exploratory expeditions. With the success of itineraries which KE has run in the past such as Mukot Peak, which sold out overnight, and Saribung Peak, which has continued to run, KE is planning some thrilling new ideas for reconnaissance trekking and trekking peak holidays for 2020 which will be announced soon. Places will be limited, so watch this space, and to find out more, email tav@keadventure.com. KE has been running adventure holidays in Nepal since 1988 with an initial focus on climbing trekking peaks. The very first trip in that year did get to Everest Basecamp – but the main objective was the nearby 6000 metre peak, Lobuche East. Over the succeeding three decades this pioneering company has picked up, reconnoitred, developed and refined a great number of trekking and trekking peak itineraries. This continual product development means that KE has explored the length and breadth of Nepal, from the Tibetan border in the far north-west to Kangchenjunga in the remote north-east, and developed one of the most extensive and specialist ranges of Nepal product worldwide.